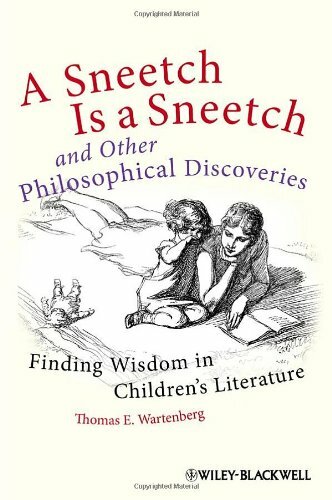 'Finding wisdom in children's literature' is a sub-sub-title to this assemblage of ruminations by the Professor of Philosophy at Mount Holyoke College, Massachusetts. Before you think that this is yet another delving into Narnian theology or the purposes of the Unnameable One you may take a clue from the main title and find that the discoveries on offer are all from picture books. The Professor is advertised as having a programme for teaching philosophy to children, with a website to match, and the present collection of sixteen short and semi-independent chapters gives some idea of his technique. He takes a picture book text which he hopes will be germane to his theme: Shreck!, say, and then expands upon its implications to examine descriptive and evaluative modes of expression. That may be tough going for the young. We rather lose sight of Schrek among the condensed explanations of language theories (assisted by panelled notes on Wittgenstein and The Philosohy of Language) and when he does re-emerge it's hard to reconcile his story with the philosophic issues he has introduced. Wartenberg is generous in suggesting that the reader may treat his chapters as separate topics capable of being read in any sequence and this indicates the rather random nature of his approach. You could, if you wished, tease out some sense of the modern progression of philosophy from the times of the Cartesian dualists and the Humian pragmatists, but there is no direct account of the issues involved in the development of philosophic thought and abstract arguments get tangled up with problems du jour such as discrimination (The Sneetches) or feminism (The Paperbag Princess). In fact the picture books often seem an irrelevant gimmick (after all their authors did not suspect that they were to be tools for a philosophy lecturer) and Wartenberg (and his publishers) offer no guidance as to what the pictured elements of the picture books have to tell us. (British philosophers will have a job getting hold of many items which are known only in North America). I wonder too, if Wartenberg actually know that Harry Allard (of Miss Nelson is Missing) is actually James Marshall, many of whose picture books transcend anything that snuffling philosophers have to offer by way of comfort to mankind. After all he twice gets the name of Viola Swamp wrong, calling her Viola Sharp.